During the month of May, after the Maine Mineral Symposium, Richard and I returned to put some more effort into the upper vein. We did begin to encounter some pocket development on the hanging wall side. These pockets were completely filled with breciated feldspar and small mica stacks hinting perhaps that these cavities once held minerals of more interest. Beryls now began to appear at a slightly increased frequency. In addition, we found more rose quartz which was fairly deeply colored. As suggested by some, this rose quartz appears to be associated with manganese as can be clearly seen in the jpeg. Occasionally we would expose a beryl of especially nice blue color. These seemed to be associated with the more smoky quartz. Our goal was to reach the pocket detected by our boring efforts last winter. However, the logistics of our benching pattern left us perhaps 6-8 feet above the pocket. To get to this level we must now go back to the lower benches and take another bite at the schist in the body of the vein. This attack would require the removal of tons of muck we had dumped into the pit in order to climb our excavator to the top of the upper bench. Now our '73 Mack and its tires would get their trial by fire. Richard and his father spent a week hauling loads from the lower pit. 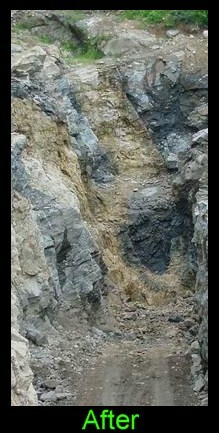 This effort dropped the muck level 10' below the top of the schist exposure in the upper pit. Richard and I spent several more days to dig it down to where we had left off last August on the bottom. The before and after pictures here give some idea of the magnitude of the effort. The exposed headwall in the picture at the left is 33' high. The 'after' picture, shot the end of June, clearly shows the schist mass that has dominated the pegmatite for the last 75' along strike. Now, the dimensions of the mass finally seem to be receding. After devoting nearly a week to the Maine Pegmatite Workshop at the begining of June (time very well spent), we returned to the Orchard to work the lowest exposure. Richard and I placed (2) rows of 10' holes across the schist to expose more of the bottom course of the pegmatite. This work revealed several large beryl casts on the hanging wall side surrounded by columbite crystals in a near brick red feldspar. (See picture at left.) While removing the contents of one of these beryl cast, Mary found the first phenakite we had seen in 3 years since the encounter of the acicular phenakites. This phenakite was 1.2 cm long and was reminiscent of the original phenakites from '98. This phenakite did not appear to be twinned, however. Twinned or not we knew now that we had to be most careful and not just dismiss any small colorless crystal as 'albite' as we had frequently done in the past. 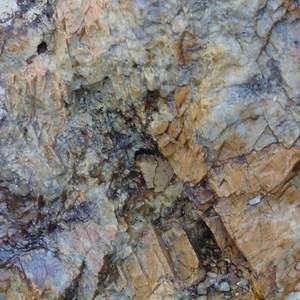 As we continued to work at the bottom, it became clear the pegmatite was plunging deeper than it ever had before. Richard and I decided to cut a deeper bench into the floor making a ' burn hole'. We drilled (12) 4' holes on 3' centers. An unfortunate consequence of this method is that the material is broken into very small pieces by the blast and, due to the location and geometry of the pattern, the material is ejected straight up high into the air. While drilling these holes it was apparent from the cuttings that we were about to expose a very large pod of quartz. With the blast complete and the material sprayed all over the pit, we setup the pumps to drain yet one more time that day the water from the working area of the pit. As the water slowly receded, we could see quartz, penetrated by very large blue-green beryls, emerging from the pool . We had not seen large beryls since last summer. Asking Richard not to disturb these precariously dangling fragments, I rushed home to get my camera. I knew ,that once removed, these beryls would be nothing but blue-green lumps. When I returned, I took a few shots of the beryls and began to look around. On the hanging wall side of the east end of our burn hole, I saw what I thought to be a quartz crystal on a plate hanging in front of a vug. When I picked it up, it was apparent it was no quartz crystal and in fact had all of the ch aracteristics of a phenakite except on a much grander scale. Pictured at the top of the page is this crystal. It appears to be a parallel growth and at the bottom emerges from the plate as conglomeration of 3-4 mm sized individual crystals. The crystal came from the circular vug below the dark smoky quartz. This crystal may be of record size for North America. A smaller vug, just above this one, produced several other phenakites. A substantial portion of this vug was lined with an overgrowth of phenakite as well. The very dark quartz, noted above, occurs in association with columbite in this portion of the pegmatite. On the foot wall side, and just under the beryl pod depicted above, we opened a pocket about the size of a basketball. This pocket was filled with microclines and a few quartz crystals. The parallel 10 cm quartz crystal depicted here was the only thing of note found in this pocket.